Here's an important article from the 1950s taking a new look at the question of planetary rulership in modern astrology. Learn why the planets rule the zodiacal signs they do - and why Pluto is a rightful ruler of Aries! Astrology is an attempt to bring order, consistency and meaning to the series of usually confused and conflicting happenings which constitute our life experience. The "basic scientist" likewise, as he tries to discover "laws of Nature," seeks to reduce the complexity and seeming chaos of natural phenomena to simple, regular and predictable patterns. Order and simplicity are the two foundations of "predictability"; and the sole business of the scientist, at the level of applied science, is to predict what will happen when. A law of science is a formula of predictability. It states that this will take place when such and such things occur together under such and such conditions. Where astrology essentially differs from modern science is, first, in making certain assumptions about the universe and man; secondly, on the basis of these assumptions, in seeking to discover not only the "order" inherent in the events of life on earth, but also their "meaning." The scientist also makes basic undemonstrable assumptions which he calls "postulates"; and religion likewise makes there is one God, Creator of all there is. The main premise of astrology, which partakes somewhat of science and religion, is that our solar system is an organized cosmic system — perhaps indeed an "organism," in the broader sense of this the basic unprovable assumption that word — a "whole" constituted of interrelated and interacting "parts." If the solar system is a definitely organized cosmic whole or organism, and if a human being on earth is also an organism, it is logical to expect that the principles of organization and cyclic growth of the cosmic system (the solar system) have some definite relationship with the principles, which determine the formation and development of a human person. The ancient astrologers started from such a premise and, deducing from it a series of consequences, formulated a system of interpretation of human experience which we know today as astrology. By using this system, we can discover the order and periodicity which is inherent in events of our life, where before we could only witness chance and meaninglessness. All astrology is interpretation. When we say that Aries "rules" the head or Jupiter the liver, we interpret the cyclic motions of the Sun or of Jupiter in the zodiac as "corresponding to" certain periodic changes and organic functions in a human body. Something happens in the solar system and something happens in a human body; we say that the former can provide a basis for the understanding of the latter. To say this, however, makes no sense whatsoever unless we have first postulated that the solar system as-a-whole and the human person as-a-whole are significantly related to one another by the simple, yet fundamental, fact that both are "organisms." Astrology as used today and in the past, without such a basic premise, has no theoretical justification. It is because the modern college type of mind, the so-called "scientific" mentality, does not accept the premise, and usually does not even understand that this is the foundation of all traditional astrology everywhere on earth, that our officially trained intellectuals scorn and ridicule astrology in all its forms. This kind of preamble seemed necessary to indicate why it is so essential for the astrological student to learn to think of the solar system as an organized whole. If we keep this basic principle constantly in mind, we should be able to solve quite simply some of the controversies prevalent in astrological circles. I am speaking here particularly of the claim advanced by some that the more recently discovered planets (Uranus, Neptune and Pluto) are "higher octaves" of planets closer to the Sun (Mercury, Venus and Mars in particular). Another related matter is the question of whether the remote planets actually can be said to "rule" certain signs of the zodiac — for instance, Uranus ruling Aquarius, Neptune ruling Pisces; Pluto ruling some say Scorpio, others Aries. I believe that if we understand the real principle of organization of the solar system, the above-mentioned questions do answer themselves. The key to such an understanding is Saturn. The first thing we should know about the solar system in astrology is that what happens beyond Saturn's orbit has an altogether different meaning than what happens between Saturn and the Sun. Indeed, the solar system, as a finite and circumscribed system of organization, extends only as far as Saturn's orbit — just as the human body extends only as far as its skin, if we think of it as a concrete and circumscribed organism. This does not mean that the concretely physical human body is the limit of the human individual. Today, everybody speaks somewhat glibly about the "aura" of a man (meaning by the term a variety of things); and modern psychologists base much of their approach to the human personality upon the realization that the field of consciousness and the ego are surrounded by a vast unconscious realm, a kind of psychological "aura" in which strange and disturbing forces are operating. What this actually means, generally stated, is that any individual whole (organism) is itself a part of a larger whole. A molecule is a component part of the greater whole, the cell; the cell fulfills a definite function as a part of an organ of the body. A man is a functioning part within the total planetary wholeness of the earth, which in turn is part of the solar system. The solar system is one of many such systems in a larger cosmic whole, which we shall here assume to be our galaxy; and galaxies are parts of meta-galaxies, or finite universes, etc. No organized unit of existence exists separately. It is a whole that contains interdependent parts; and it is itself a functional unit related to other functional units within a larger whole; a vaster, more inclusive scheme of organization. For this reason any organic whole must contain two different levels of activities. At one level, it is strictly what it is as an individual whole — it is a relatively "closed" system. At another level, it is in constant interplay with the other individuals which are parts of the same "greater whole"; and moreover it is subject to the action of this greater whole. That is to say, every cell of my body is related to every other cell; above all, it is subject to the pressures and demands of my organism as-a-whole, even as it is fed by the substances in my blood coursing through my entire body. This can be expressed in more psychological terms by saying that while I know myself as a distinct individual person, John Smith, I also am aware (or should be aware) that I am a member of the human race and a participant in a particular cultural and national whole, together with a multitude of other individuals. I am an individual, but I am as well a part of a collective whole — my community, my civilization, the human species, the earth, etc. I can thus distinguish within the totality of my personality a field of consciousness and activity which is the domain of my ego, "I, myself"; and a much less precise realm, fading out into complete unconsciousness, in which the collective mentality, the collective feelings and "images-symbols" of my culture and my race are constantly acting upon the conscious "me." The collectivity in which I operate as an individual is bringing to me new thoughts, new interests; and it is as well subjecting me incessantly to pressures of all kinds, trying to use me as its tool or agent, asking me to conform to its demands and to transform or surrender much of my "individual rights," my egocentric attitudes or fears, my ideals, my reluctance to act in terms of the collective interests or passion. The psychologist following the trend of ideas initiated by Carl Jung speaks of the "conscious" and the "collective unconscious"; the ego is seened by Jung as both the circumference and center of the "conscious" — that is, of all that is happening within the field of consciousness of the "I." These concepts, however, because of the "scientific" and empirical nature of Jung's approach to psychology, are rather vague and, in a sense, confusing. They fail particularly to give a satisfying picture of the ego, for to say that the ego is both the center and the circumference of the field of consciousness is to miss the most important fact of a deeper, more spiritual psychology. Astrology can clarify the psychological picture most significantly by telling us that Saturn represents the structural power which builds the ego, while the Sun is the central source of the energy which animates the whole system of personality (corresponding to the whole solar system). It can show also how the human personality, as soon as it reaches a higher state of development, finds itself constantly subject to the pulls of two great forces, that of the Sun and that of the galaxy. We have, in other words, three basic centers of influence in the full-grown individual personality: the Sun, Saturn and the galaxy — the latter operating in the personality through the planets that are beyond Saturn (i.e., Uranus, Neptune, Pluto and probably one or two more as yet unsighted planets). The field of activity extending (symbolically at least) between the Sun and Saturn is the field of the conscious; it is energized by the Sun and structured at one level by Venus and at another by Saturn. The field of activity beyond Saturn's orbit represents all that is also beyond the strictly conscious activities of the individual, of the person defined by his or her ego structures and by the shape and the limits of his or her physical body. These two fields are essentially different in character. What do I mean by "ego structures"? Everything that gives a particular and relatively unique shape to our inner life — to our feelings, thoughts and responses to everyday events — is included in this term. We are born in a particular environment and with a particular heredity (genes), at a particular time in history. We are subjected from birth (and indeed before birth) to incessant impacts and challenges. To these the newborn is forced to respond in some way — either in the way of a positive response or by refusing to react, which means a negative response. The sum total or synthesis of all these responses manifests as the "structure" of the consciousness — the Saturn-ego. Saturn represents the power that organizes or systematizes all these responses into traits of character, into complexes and personal idiosyncrasies. To this we refer when we say: "You must take me as I am; that's the way I am." Thus speaks the Saturn-ego. There is, however, within the human personality a central power which we should not confuse with this Saturn-ego. It is actually an impersonal force — indeed, what we might call the "life force." It is to this that the Sun refers in astrology. This solar force is actually undifferentiated at source. The Sun should, I believe, be considered as a lens through which is focused and released the universal energy of space itself (or of "God" if we wish to use a religious term). The Sun does not produce energy as much as it brings a "higher" type of creative power into atomic-physical expression. Likewise, a "source" does not manufacture water; water is released through it on the earth surface. The sun, in a human being (and in a birth-chart representing this being), is, thus, a super-personal "principle" or "source of energy." The originally undifferentiated solar energy becomes differentiated as it passes through the "spheres" (or orbital spaces) of the planets. Mercury transforms it into the basic electrical force which animates all things; Venus, by adding to the bipolar mercurial electricity the factor of magnetism, leads to the formation of "electro-magnetic fields." These Venusian "fields" constitute the seed patterns of all that lives. They are not visible normally to man's present eyes; but they are, nevertheless, the power that compels the acorn to develop into an oak tree and not into an apple tree or any other plant. They are what a Platonic philosopher might call the "archetypes" of all species of life. Each biological species has its own archetype or seed pattern. In the case of man, however, it is possible for each at a certain stage of human evolution to become spiritually individualized. That is, as Rudolf Steiner once put it, every man can become an entire species of life. In every man today is the potentiality of his manifesting, in actual living, a unique "archetype." It is only as he does so that he becomes truly an "individual." Before that, he is only a member of the human species modified by racial and environmental conditions. This Venusian seed pattern of individuality, however, is not the ego! It is the "Higher Self" or "Spiritual Individuality" of a person. It is not built by Saturn; it is instead the spiritual form which the superpersonal Sun force assumes in a particular person but which remains latent in most human beings as they grow up through childhood and adolescence; as they are subjected to the impacts, pressures and challenges of family, religion, school and society. It is, I repeat, the person’s responses to these impacts which gradually builds up the character traits and complexes of the Saturn-ego. All that the Venusian seed pattern within the growing human being can do, in the great majority of cases, is to stand as a potentiality, an imminent presence, seemingly "asleep," yet occasionally perhaps being felt by the maturing person in times of crises or acute emotional challenges. Jupiter and Saturn are the planets which rule over all social functions, all that relate us to our group, our community. Jupiter marks in us the development of the "social sense," the feeling of fellowship, of "belonging." Saturn crystallizes his feeling in establishing the "place" which we occupy in society. Saturn represents the father, traditionally, because our father gives us our socially recognized "name" and normally has much to do with our position, class, wealth, etc., in the community. These give stability to our ego. When we are completely dominated by the Saturn-ego, we tend to act in an egocentric manner. The structure of our consciousness becomes rigid, unyielding, dogmatic. This rigidity of character and ideology grows the stronger the more insecure we feel, socially or in terms of family and group relationship. Of course, the Saturn-controlled field of consciousness is in any case filled with solar energy and vitality, for the Sun force flows indifferently upon everything; but this Sun force cannot radiate outward beyond a rigidly dominant Saturn. It is caught by the Saturnian structures of the ego and manifests as egocentric power, pride, dictatorial attitudes — all of which usually hide a deeper sense of insecurity or inferiority. Our present world is filled with such Saturn-egos. A time may come, however, when Saturn's power is being challenged; and the first challenger is usually Uranus. When Uranus, Neptune and Pluto act in the personality in a focused manner (i.e., at times of strong "transits"), personal crises tend to occur — unless Saturn, out of fear, is able to stifle the disturbance for a time. These three planets beyond Saturn represent energies which stream from the outer space and toward the field of the Saturn-bounded solar system. They are the basic powers of the collective unconscious seeking to "invade" the realm of the ego-structured consciousness, the realm where the "I, Mr. So-and-so" rules. This invasion is, however, in most cases essentially salutary, even if temporally shattering. It represents the action of the vaster cosmic whole, the galaxy, seeking to feed the consciousness with "spiritual food" seeking to heal the personality of its binding and stifling egocentricity — a healing which may require at first a severe catharsis. Unfortunately, the ego-dominated consciousness sees in all such galactic attempts intrusions, unacceptable challenges to its "sovereignty." This Saturnian fear increases the rigidity of the ego-structures, and a struggle develops — perhaps a violent crisis. The powers of the galaxy try to break down or, if possible, to inspire and transform the Saturn will of the ego, while they also try to arouse the Venus archetype out of its slumber by compelling the Sun force to "resonate" in a new way to the galactic keynote. The important point, in terms of this article, is that Uranus is the spearhead of a power which moves from outer space toward Saturn and the other planets. While the tide of the Sun force moves from the central Sun, through the planets and toward the periphery of the system, the galactic energies move from what, to us, is outer space (yet is rather the "body" of the galactic organism) toward the Sun. Thus, Pluto, Neptune and Uranus constitute the three basic phases of a process operating in a direction opposite to that of the process known within the solar system proper, from the Sun to Saturn. The first process is centripetal; the second, centrifugal. When Uranus, Neptune and Pluto are considered as "higher" expressions of such planets as Mercury, Venus and Mars, all these planets are lumped together into one category. The closer planets are seen to represent a "lower octave" of biological-personal functions or energies; the more remote ones, beyond Saturn, a "higher octave" constituted of more transcendent and "spiritual" activities or qualities of being. There is some truth, no doubt, in such statements if one restricts oneself to a consideration of only the external events of a person's life. The "illuminations" which Uranus may bring to the consciousness that is not frozen into Saturnian rigidity can inspire and transform the Mercury mind. The compassion and inclusiveness which are characteristic of Neptune do act directly — if allowed by Saturn so to act—upon the sense of value and the feeling-judgments represented by Venus. The power of inescapable destiny and total surrender to a cause, which defines essentially Pluto's operations, do transform — if allowed to do so — the strictly personal initiative of Mars. But the essential fact is that the activities of Uranus, Neptune and Pluto run counter to the normal functions of Mercury, Venus and Mars. The former are not just personal activities of a "higher" kind; they are activities meant to disturb and transform — indeed, utterly to repolarize and reorient those of Mercury, Venus and Mars. The source of Uranus' power is basically different from that of Mercury's power. You do not understand the meaning of the difference between "conscious" and "unconscious" if you say that the unconscious is a "higher" type of consciousness; yet this is what so much that passes for occultism or metaphysics seems to be saying these days. To use the word "super-conscious" does not answer the difficulty either! The galaxy is not "super" to the solar system, no more than a city is a "super citizen." The difference between the galaxy and the solar system refers to the fact, stated early in this article, that everything that exists is balanced between two pulls of opposite and complementary character. Collective and individual constitute the two polarities of all existence. One polar current always opposes the other; yet they meet. In the solar system, they meet in Saturn. Saturn, from the point of view of the Sun force, is the limiting agent defining boundaries of individual existence in a particular life organism. But Saturn, from the point of view of the galactic power, is a "place of power" — the shrine, the "Secret Place" of the Kabbalist, the Diamond Body also — within which the two forces, galactic and solar, can be integrated. There, collective and individual may meet and interpenetrate in rhythmic "marriage." But this can take place only when Saturn-the-ego has surrendered its fortified walls, its exclusivism and its fears; when the "I" is transfigured by the light that streams forth from "the brotherhood of stars" (galaxy). Then the Sun force and the galactic power course through the total organism of personality. The idea that a planet "rules" a zodiacal sign has very little to do with the assumed "fact of experience" that the "natures" of the planet and the sign are similar or friendly to each other (as many astrologers say). 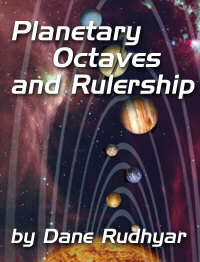 The concept of rulership is deduced logically from the position of the planets in the solar system. It has meaning in a strict sense only in terms of a closed system of life organization; thus within the purely individual field of consciousness limited by the orbit of Saturn. If we study the traditional scheme with its "day-houses" and "night-houses," in which each planet "ruled" over two signs of the zodiac, this conclusion is hardly avoidable. Here we have the solid and steady pattern of the bi-polar life force which streams from the Sun and returns through the consciousness of the individual to the Moon. The zodiacal picture is one in which the first degree of Leo is the starting point. This is the zodiac of individuality, in contrast to the zodiac of nature which begins with Aries. The scheme of rulership establishes six levels or "planes" we have in it, thus, the usual division of the "One Divine Potency" (which is the undifferentiated energy of space) differentiated into six "powers" or shakti. This is the basis of all sevenfold systems of classifications found in most metaphysical-occult and mythological traditions. The "seventh" is an unmanifest principle, which can be seen only in its sixfold expression. If we start from the ego consciousness of man today (Saturn level) the Sun-Moon level is the sixth: the level of pure duality, the foreshadowing of the "divine marriage" of Sun force and galactic power above mentioned. The Moon is indeed that which "hides" the power of the galaxy, for her hidden side is always turned to outer space (as far as we, on earth, are concerned). As that "hidden side," she is the male god, King Soma, ruler of the great mysteries, whose progeny is Mercury—wisdom (the fifth level, the illumined mind). In an "open system," the concept of rulership has no evident place. At best, one can speak of zones of focalized influence. It is only in such a sense that one can say that Uranus tends to operate in a more focal manner when in Aquarius, Neptune when in Pisces. Aquarius and Pisces come into the rulership scheme under the Moon's line of influence; and I just stated that the Moon "hid" the reality of the galaxy—being the "mediatrix," the Muse, the eternal feminine whose dark side may either lead you to the Brotherhood of Stars or to the abyss of the "eighth sphere" (the realm of disintegration, hell). If Uranus finds a focused field in Aquarius, and Neptune in Pisces, then Pluto should inevitably be related to Aries; yet astrologers today very often say that Pluto "rules" Scorpio. If this were true, the entire pattern of rulership would be meaningless, for anything that breaks a logical sequence can have no significant place in astrology, all "experimental evidence" notwithstanding — the latter turning out to be, in most cases, but the "feelings" of some atrologers that something should belong somewhere, feelings which usually are quickly contradicted by some "proof" (statistical perhaps) adduced by some other astrologer!